and the half bathroom downstairs…. has our dachshund tree! ---------------------------------------------------------- Merry Christmas! This week I am sharing the entry and living room. I am sure it will look much different Christmas afternoon! and in to the living room! where there is a large live tree and two family trees which contain pictures of the family past and present…..
From my home to yours… I hope you have a very Merry Christmas! More Christmas decoration! This week I am sharing the master bedroom and bathroom. all the decorations make it hard to leave the room! But the bathroom has reindeer! 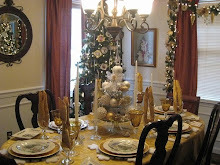 This week I am sharing pictures of the dining room. It is my Santa room. Mr Claus and his sleigh are on the table…. And of course there are a couple Santa trees! and the window is filled with more Mr and Mrs Claus…..
For the next few weeks I will be sharing some of my Christmas decorations. This week I am sharing the kitchen. The kitchen is my nutcracker room. I start with an army of nutcrackers…..
and then find a home for the holidays for each of them…..
and of course there is a nutcracker tree! a lot of sparkle to be found…. and the table set for lunch…. I hope you enjoyed visiting the kitchen. Come back next week to see another area!